You can reduce back pain and even heal lower back pain with some simple yoga exercises. It sounds too good to be true but it really is simple to relieve lower back pain with yoga techniques. Exercising your back with carefully balanced stretches and strengthening poses is a rule of healing lower back pain. If it is not healed it is relieved from its pain for duration of time. Tight muscles, ligaments and worn down or damaged discs all contribute to an interruption in the energy flow through the nerves. Through lower back exercises we open up space and re-balance the muscles. It is always satisfying to find out exactly what is causing your lower back pain by qualified experts. Knowing what’s causing lower back pain within your body doesn’t change the exercises you will need to do for back health. Try to identify if something you’re doing is aggravating your back and avoid it. If you can’t avoid lower back pain aggravating tasks make proper back posture changes while performing them. This simple exercise for your low back can really help reduce the pain especially when nerves are being impinged. Try to lengthen the side that feels tightest and combine this stretch with the other simple stretches below. Repeat this exercise taking the knees lightly towards the chest 12 times. Cobra Pose is a pose that should be done lightly when low back pain is present. It is a pose that really helps to open up movement in the low back but also can aggravate low back pain when done in a boundary that is too deep. Triangle pose is a wonderful lateral (side) stretch. In balancing the spine lateral stretches are important as one side is usually tighter than the other. The pose shown is a little too deep for most people as this is the yoga version but for healing you just lightly stretch the leg muscles placing the hand down on the left leg somewhere just below the knee for support. You then hold and relax. Do this on each side until both sides feel evenly stretched. You must be careful with forward bends. They strain the discs and sometime aggravate lower back pain. The pose shown is far too deep for most people so bend the knees and lean forward until you feel a mild stretch. Hold until the legs and lower back loosen. The secret is time. You must hold the pose lightly until you feel everything open considerably. 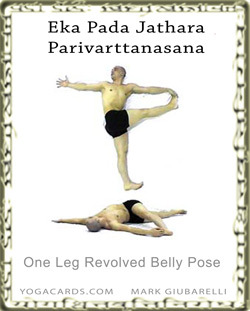 Printable Yogacards yoga posture to help relieve back pain. All of these postures can help relieve and heal back pain. Click on any below. The above postures can really help reduce and even heal lower back pain when done regularly. Fibrocartilage and fibrous tissue forming around the outside of the intervertebral disc to protect the inner nucleus pulposus. When this protective sheath is damaged the inner part of the disc can bulge put causing pain in the affected nerves. 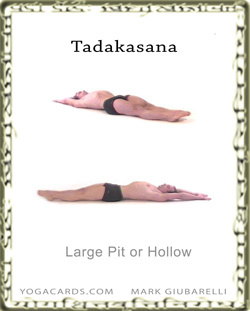 Yoga For Back Problems Part 2 or learn how Tadasasna a pose in yoga can help prevent back pain. Yoga for back pain exercises for stretching the spine are below. Back exercises are necessary for a healthy spine and can many times remove back pain but proper posture must also be practiced to greatly reduce back pain on daily basis.